Single-serve blenders are very popular at the moment because many people are trying to live healthier lives, and making nutritious smoothies is a great start. With a lot of brands producing attractive single-serve blenders, it can be confusing choosing which unit to buy. We are here to help and we’ve chosen to compare two of the most well-loved single-serve blenders available today, namely the NutriBullet Pro and the Nutri Ninja Auto iQ. These companies are known for providing high-quality and high-powered compact blenders with varying features. Both make it easier for users to create smoothies and other nutritious meals in just seconds or minutes. They may be compact and only take up a small amount of counter space but they are packed with powerful motors. Cleaning up after use is easy and fast because they are dishwasher safe. Most verified users love using them even if they have a few issues. What Features Should You Look for in a Blender? Owning the right tools and appliances in the kitchen makes it a whole lot easier to live a healthier lifestyle. Choosing the right single-serve blender takes you a step closer to having a healthier body, which is why it’s important to think first before you buy. 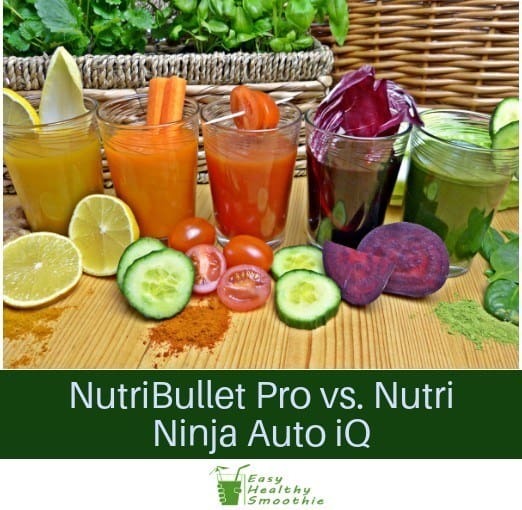 Two great contenders when it comes to high powered blenders are the Nutribullet Pro and Nutri Ninja Auto iQ. Selecting one is quite tricky so we have written this review to let you know what’s great and what’s not so great about them. We’ve done all the research for you so it will be easier for you to choose which one is best suited for your needs. It’s quite obvious that the Nutri Ninja Auto iQ offers something that the NutriBullet Pro doesn’t have, and that is the Auto iQ feature. The blender’s ability to fully use its powerful motor by combining it with a well-designed blade for a more efficient blending process. Simplified operation, making it easy for you to figure out how to use your blender. Control over the blending process, with the ability to blend manually for more control or use pre-programmed blending cycles. Convenience of taking processed products for on-the-go options. NutriBullet has produced a range of compact blenders designed to help those who want to live a healthier life. The power of the motor is very important to the blender’s pulverizing capability and the NutriBullet Pro is equipped with a powerful one. The 900-watt motor has a maximum speed of 25,000 rpm. Furthermore, it operates at a single speed which successfully pulverizes most ingredients. Additionally, it is suitable for ice and frozen ingredients with the addition of liquid. It performs at its best when creating cold smoothies and sorbets. Its ability to work with frozen ingredients is due to the stainless-steel blade, which is designed with 6 prongs. The two lower blades help provide smoother drinks and also work well for grinding dry ingredients. Don’t be surprised if you don’t find any buttons on your NutriBullet Pro because most of their blenders do not have a button to press. To use it, you’ll need to fill up the jar with your chosen ingredients, screw in the lid with the blade then line it up with the base to let it blend on its own or to use the pulse mode. You use the pulse mode by simply pressing down on the jar and once you release, the blending also stops. Additionally, you can let the NutriBullet Pro blend on its own by twisting the jar into the base to lock it in place. To switch it off, simply untwist the jar. Since the NutriBullet Pro is meant to be a single-serve blender, it doesn’t come with pitchers. Instead, it comes with 32 oz. and 24 oz. BPA-free plastic cups that don’t easily break even if you accidentally drop them. Additionally, sets also include lip rings to make it more comfortable to drink out of the cups. There are also go-fresh lids so that you can take your freshly made smoothie with you on the go. Even the tiniest kitchen can accommodate the NutriBullet Pro because it is so compact. It’s great for individual use and afterwards, it is also easy to clean. It’s dishwasher safe so you don’t need to wash it by hand. The NutriBullet Pro is a compact yet powerful single-serve blender and many verified customers agree about its power and ability to produce smoothies without chunks. Others also love the hands-free mode where you just lock the jar in place and it blends on its own. On the other hand, one cause of concern is the design of the blade because some find that can cause leaks. Now that you’ve read about the features of NutriBullet Pro, it’s time to see what the Nutri Ninja Auto iQ has to offer. Nutri Ninja offer a range of single-serve and multi-serve blenders. Let’s see if the Auto iQ can beat the NutriBullet Pro. Nutri Ninja is known for using powerful motors in their blenders and they have done with the Nutri Ninja Auto iQ. All four models in the range have a 1000-watt motor that spins the blades at a speed of 21,000 rpm. The full power of the motor is enhanced by the 4-pronged stainless-steel blades that may be blunt but are durable enough to crush and pulverize ingredients with the help of the powerful motor. Furthermore, these blenders offer blending at two different speeds, a pulse option and also pre-programmed IQ settings for better control over the blending process. The Auto iQ feature makes things easy because it automatically blends things to the right consistency. This feature helps busy people make their healthy drink by simply pressing a button and leaving all the work to the blender. It automatically stops once the programmed blending cycle ends. Choose between Blend and Ultra Blend for the Auto iQ technology. Different accessories will be included with different models and they may include a 32 oz. cup, a regular 24 oz. cup, an 18 oz. cup, sip lids and seal lids. The cups are made of Tritan, a BPA-free plastic that is durable. Furthermore, the parts are dishwasher safe, making cleanup easy and fast. Simply place them on the top rack of your dishwasher and they are good to go. Plus, you also get a recipe book to get you started and a wellness guide. Some sets also include other reading materials to help you on your journey to be healthier with Nutri Ninja. Among the community of verified Nutri Ninja Auto iQ users, the powerful motor and the Auto iQ feature are highly praised they make smoothie-making a more enjoyable experience. Many people love the fact that you don’t have to stay in front of the blender all throughout the blending process. You can leave it to blend on its own. On the other hand, some customers complain about the noise it makes, which is quite common not only for Nutri Ninja Auto iQ blenders but for other blenders as well. Have you decided which blender to choose? Is the Nutri Ninja’s Auto iQ feature a deciding factor? The Nutri Ninja Auto iQ has a 1000-watt motor vs. the 900-watt motor of the NutriBullet Pro. The NutriBullet Pro simplifies the use of the blender by not using buttons while the Nutri Ninja Auto iQ provides control through buttons. The Nutri Ninja Auto iQ allows for two speed selections, a pulse mode, and preset programs vs. the Nutribullet Pro that runs at one speed with a pulse mode. Choosing a blender to use every day to aid you in your journey towards healthy living is personal choice and will depend a lot on which features you find useful for your lifestyle. Consider all the features, identify what is useful for you, understand each product’s drawbacks and then decide which one is right for you. Personally, I find the NutriBullet Pro to be a better blender than the Nutri Ninja Auto iQ. Although it doesn’t have the automatic features, I find blending to be more enjoyable with the easy and simple manual control. Plus, I love the design of the blade because it ensures everything is well blended, even bits that fall to the bottom.